SEAL System’s SharePoint solution consists of two modules which are connected to each other: a SAP Export to SharePoint and a SharePoint Export to SAP. In both modules the user stipulates which documents and information are to be exported. This information and documents are identified using an automatic process and transferred via an interface to the relevant counterpart which can be SAP or SharePoint. Here, 25 SAP-processes and 39 transactions can transfer documents and Informations from SAP to SharePoint. This solution is of interest to all businesses who are looking for a simple, automated and reliable solution for exchanging information between SAP and SharePoint or who want to exchange documents from SAP with their customers, suppliers or other partners using SharePoint. 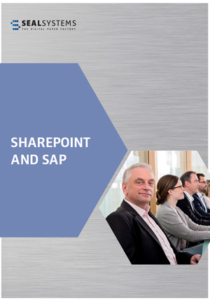 You can find more information on our subpage about SAP and SharePoint or in our new white paper.